A series of live performances featuring musicians and visual artists that cultivates new works and ideas in an intimate space. The main focus is bringing together the community of emerging performers and modern listeners. Opening Night will feature performances by PYRON, Tingerine Liu, and Sabine Holler. The narrative of their transcendent music and visuals is driven by the free-writing and vocalizations of Jennifer Pyron immersed in electro-acoustic performances and transformed by sound and visual processing. Their debut album contains guest performances by fellow NYC improvisers Lara Brodsky, cello, Mo Khubarra, drums, and Theo Woodward, vocals and electronics. Tingerine Liu is a Chinese-Singaporean filmmaker. 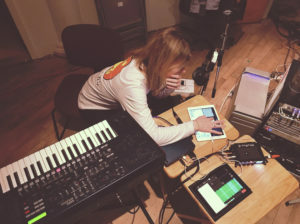 Like a whale living underwater, she occasionally surfaces from the solitary confinement of screenwriting for a fresh breath of improvisational, adrenaline-inducing freedom by VJing for live musical performances. A sentimentalist and hoarder of media artifacts, she loves discovering and amassing video content from the internet and creating collages out of them. Her current work explores how repurposed video footage can interact with the music – colliding and shaping the musical landscape – like waves pushing and pulling against the sand. Sabine Holler is a singer, songwriter, music producer, multi-instrumentalist and performance artist born in Sao Paulo, Brazil, and currently based in Brooklyn, NY. Her career started in 2008 when she founded the Brazilian experimental rock band, Jennifer Lo-Fi. She also has been a key part of the groups Ema Stoned, Mawn and most recently, the Brooklyn pop band, Barrie. Her sound travels through the genres of alternative, ambient and pop music, with the use of pedals, loops, samples and strings, where she builds up hypnotic layers of sound, harmoniously setting the perfect environment for an emotional and visceral singing.